Looking for that special Michele Obama dress ? 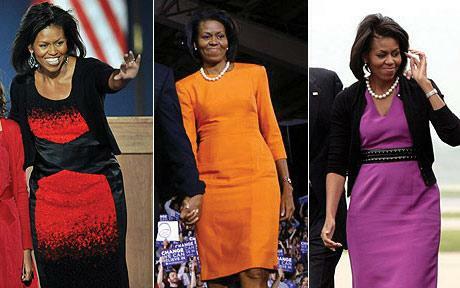 Michelle Obama's signature style, is modest. Chic and modern, Mrs. Obama favors down-to-earth belted shifts and chunky pearls. She also shows off her shoulders and arms and often experiments with prints. Mrs. Obama's flipped hair and modest ladylike attire suggest an updated Jackie-O look. A classic shift in a strong bold color with a black belt gets you there! It is possible, of course, at a time when campaign images are scrutinized by media sibyls as ardently as the entrails of birds were read by the ancients, to read too much into Michelle Obama’s grooming and wardrobe. Yet people who track these things see in her simple sheaths and Donna Reed flip, her streamlined silhouette and fondness for pearls, parallels with former occupants of the White House, women like the first Mrs. Bush and Jacqueline Kennedy.